ThemeParkMama: WOW Easter is almost here! Check out Oriental Trading for Easter egg stuffers! WOW Easter is almost here! Check out Oriental Trading for Easter egg stuffers! Easter is probably my 3rd favorite holiday, I get to dress up my kids and take them out to find eggs and other goodies. Each year though I come across the same issue of finding things for the Easter eggs, and baskets, but more so the eggs, because hiding chocolate in FL heat just does not work. Oriental Trading is a great place to shop for Easter. I cannot believe the selection of fun little goodies they have and for so cheap. Oriental Trading fits almost everyone's budget including teachers, parents, church groups, fund raisers, and so much more. This year I picked out more items then crafts like I have in the past with Oriental Trading. My kids enjoy crafts and there are certainly plenty to pick from in the Oriental Trading Easter crafts section. I ended up with some fun goodies and candies from Oriental Trading for my kids Easter eggs and baskets. I got the following products to make this years Easter more fun for the family. Easter Turtle Squirts: Ready to turn Easter Sunday into Easter funday, these Easter Turtle Squirts have their turtle shells painted like Easter eggs! 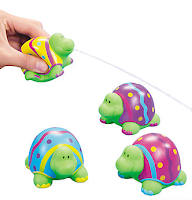 Toss these turtle toys in Easter baskets or party treat bags for a fun surprise. Let the Easter games begin. Vinyl. 3" © OTC. 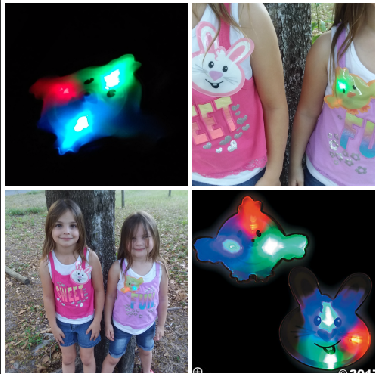 These are cute little turtles which you can just throw around the yard and the kids can find them with their bright Easter egg colors, once you find them you can possibly depending on where you live (might still be cold....jealous) set up buckets and have a squirt out Easter egg hunt party. 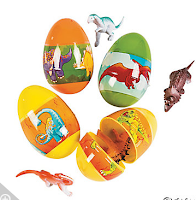 Toy-Filled Dinosaur Plastic Eggs: Children will roar with excitement when they find these Toy-Filled Dinosaur Easter Eggs during the hunt. These special Toy-Filled Dinosaur Easter Eggs puts a Jurassic spin on your traditional Easter egg hunt. Children of all ages will enjoy playing with their new dinosaur and learn about their history. Hide these unique eggs in your Easter egg hunt and watch the creativity hatch before your eyes. Each egg includes a 2" plastic dinosaur. Plastic. 3" © OTC. I love these eggs, they are wonderful because I don't have to do anything!!! All I have to do is go around my yard and throw them and that is it! I don't have to open and fill them, they are already set up ready to go! My kids will enjoy the dinosaurs and better yet they won't melt like the candy options. Haribo® Happy Hoppers Gummy Candy Fun Packs: Your Easter Sunday isn’t complete until you include these Haribo happy hoppers gummies in your Easter baskets and plastic Easter eggs! Includes assorted fruit flavors: apple, orange, lemon and strawberry in each pack. (7 pcs. per pk., 27 pks. per unit) Fat-free, total wt., 9.5 oz. How cute are these! I already love Haribo so I kinda got these for myself LOL but the kids can still hunt them for me.......joking they get to keep what they find but some might not make it into the eggs. I love that they fit so nicely in the egg and they taste great along with being Easter themed shaped like little bunnies, carrots and bunny heads. Peanuts® Easter Stress Balls: Squeeze some stress out this Easter with Peanuts and the gang! Put these relaxing toys in your Easter baskets. Colorful and squishy, these stress balls feature everyone's favorite beagle, Snoopy, and his lovable sidekick, Woodstock. Great as Easter giveaways, these eye-catching novelties are a hit for both children and adults! Includes yellow, blue, pink and green. Foam. 2 1/2" Only at OTC / © 2016 Peanuts Worldwide LLC. 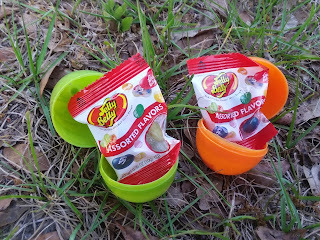 Hehehe so these are a win win for both kids and adults, after a long day of finding eggs and balls and squirters, along with eating a lot of candy, kids can well become a bit exciting. Thankfully you were smart enough to add the Peanuts Easter Stress Balls to your order so each kid has one and your able to squeeze it out before your home, or before bed :) These are super cute, they come in bright pastels and feature Snoopy and Woodstock in loveable Spring Easter settings. Peanuts® Easter Magic Color Scratch Characters: This Easter activity for kids is a fun and simple way to keep them entertained! It's a great party giveaway and a perfect Easter basket stuffer. Our Peanuts® Easter Magic Color Scratch scenes make sweet Sunday School gifts for students and nice additions to handmade Easter cards. 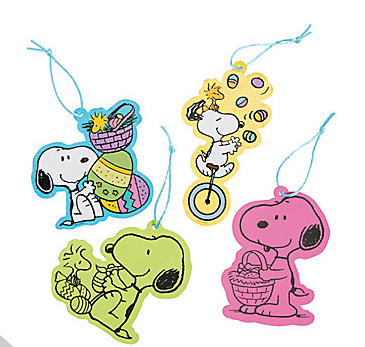 Simply scratch away the colored surface to reveal a Peanuts® Easter scene. Includes assorted Peanuts® characters, scratching tools and satin cords. Paper. (2 dozen per unit) 3" - 4" x 6" Only at OTC / © 2016 Peanuts Worldwide LLC. Yes I like Peanuts, they were apart of my childhood so I am always looking for things in which my kids can enjoy that reminds me of my own childhood. The scratchers are a great after the egg hunt calming craft that the kids and adults can do. They come in pastel colors and as you scratch them you can revel the hidden colors below. Easter Light-up Badges: Give your Easter egg hunt/midnight rave some flair with these amazing Easter light-up badges! 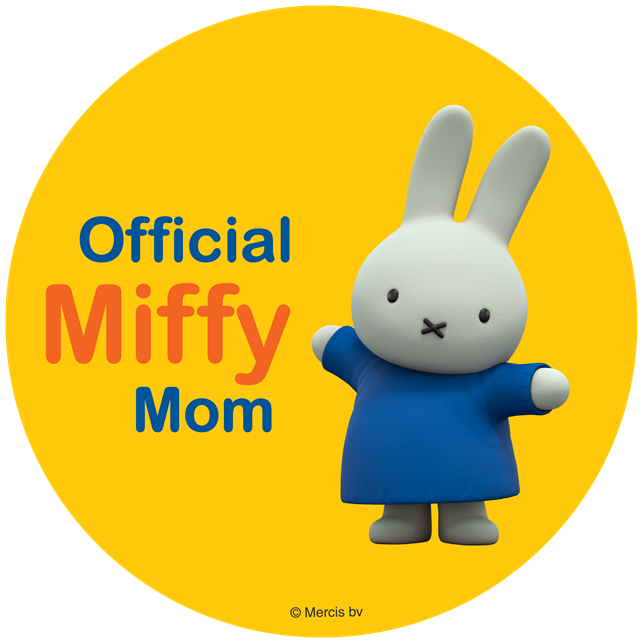 Press these self-adhesive badges to watch them flash red, blue and green. Perfect for your Easter party or as Easter basket stuffers! Give one to each of your friends and start your own light-up club. Featuring an assortment of Easter characters. Plastic. 3 3/4" - 4 3/4" x 4" Includes batteries. © OTC. Another huge favorite of mine! I mean who doesn't love things that light up!?!?!? These are so freaking cute! They come in a white bunny and yellow chick, they stick to you, and they have a button which you press that starts a light show of green, red and blue! LOVE these and my kids really enjoyed them as well. Oh they are also a heavy plastic so if they get wet you do not have to worry about them not working. Pastel Color Brick Party Pinwheels: Don't go spinning in circles as you plan your party! Pastel Color Brick Party decorations and party favors make event planning easy. 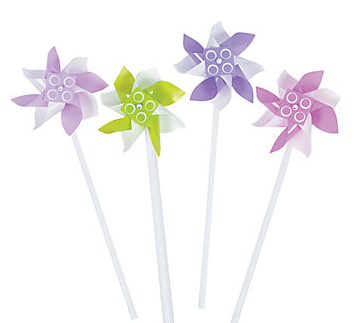 These cute pinwheels are perfect party decorations. Get crafty and create a fun DIY centerpiece with a vase and some foam, stick them in the ground in the yard when you attach them to spikes or add them to your treat bags. Plastic. 4 1/2" x 12 1/4" © OTC. These were not in the Easter section of Oriental Trading but I picked them out because of the pastels and who doesn't enjoy a pinwheel? We used them to point out eggs for the younger ones as well. Jelly Belly® Mini Packs: Jelly beans are always a fun addition to your celebration! Everybody loves finding a little candy in their goody bags. These classic Jelly Belly® Mini packs make wonderful Easter basket fillers, stocking stuffers and birthday party favors. Whether you hand them out, or scatter them around, kids and adults love eating these decadent delights. Assorted gourmet flavors. (Approx. 11 pcs. per pack, 3 dozen packs per unit) Total wt., 12 oz. © OTC. What Easter would be complete without jelly beans? and not just some jelly beans but the best out there, Jelly Belly. You have to act fast! Oriental Trading is having a sale on Easter items! They are going fast and what is great about Oriental Trading is they are always changing up their products so one day it might be there and the next its something even better. Check out all of the Easter items at Oriental Trading now, before its to late! Don't forget that not only can you use Oriental Trading for the Holidays, but Birthdays, Halloween Costumes, Parties, Weddings and the list goes on and on. 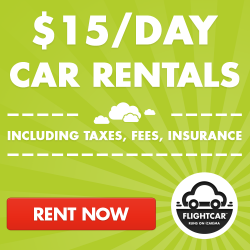 Check out all the amazing, fun and cheap products at Oriental Trading here!